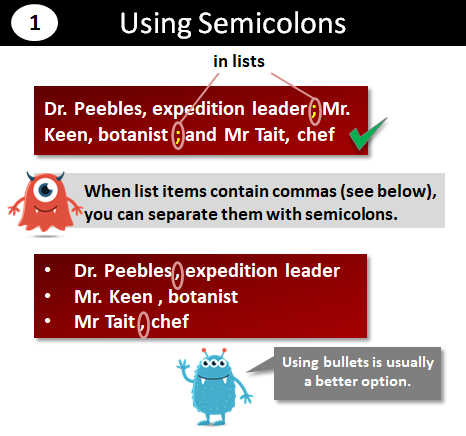 In lists when the list items contain commas. To create a smoother transition between sentences, particularly when the second starts with a phrase like however or as a result. Before a conjunction that merges two sentences containing commas. Lists can get quite complicated. If the information is important, you should consider using bullet points. It was serious. She broke a toe. It was serious; she broke a toe. A semicolon is less of a "speed bump" than starting a new sentence. It was serious, she broke a toe. That's called a run-on error, and it's a very common mistake. Try to resist the urge to use semicolons for this purpose. Adjacent sentences are usually closely related. They don't all need semicolons between them. Keep this in your back pocket for occasional use. Use it for effect or to showcase your writing skills. If you use too many semicolons, you'll just annoy your readers. This next point is very closely related to the last one. Often, when merging two sentences into one, the second sentence will start with a bridging phrase (or a transitional phrase as it's called). Common ones are as a result, consequently, therefore, and however. She broke her toe. As a result, the game was cancelled. She broke her toe; as a result, the game was cancelled. Lee likes cake. He likes pies. Lee likes cake, and he likes pies. When this happens, it is normal to use a comma before the conjunction. At the end of the day, Lee likes cake; and he likes, well, actually prefers, pies. 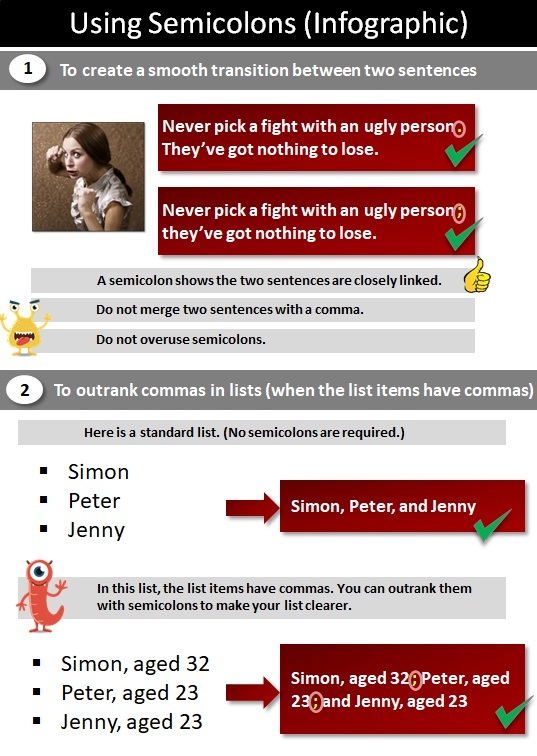 This is quite an outdated practice, but you can use a semicolon for this purpose if you think it'll help your readers. 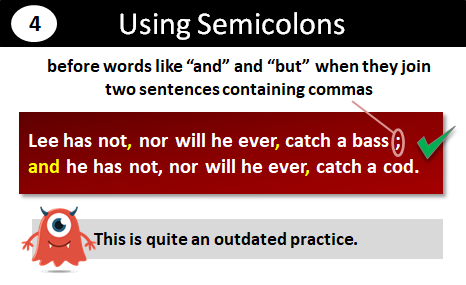 If you wanted, you could get away with never using semicolons because there's always an alternative. 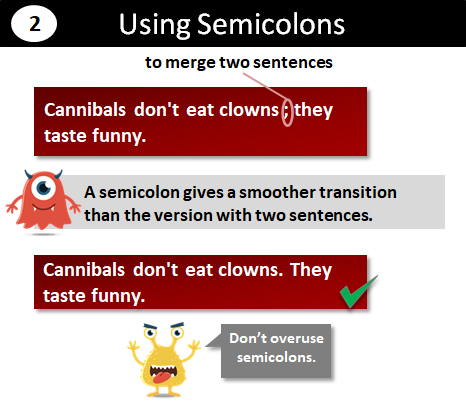 Do not use a semicolon for an introduction. That's what a colon (:) is for.